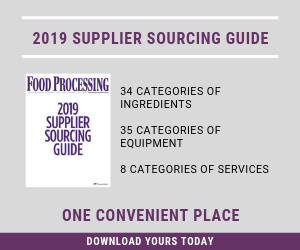 It's the start of another year, and food processors are looking to innovative flavors — in microingredients such as extracts and essences or via macroingredients such as fruits and nuts. Flavor systems and profiles are expanding both to hold consumer interest and to meet the challenges inherent in creating new products that satisfy demands not just for flavor but for health and convenience. At the top of everyone's list, it seems, is not a flavor but an adjective in front of the word flavor: "natural." "Natural flavors are the new wave of food and drink products," says Dana Sanza, a flavorist for Fona International, Geneva, Ill. "Consumers increasingly are concerned with selecting healthy, good-for-you products with clean labels. They want natural ingredients and great taste." "Redefining natural" was one of the packaged goods trends cited by Mintel International in a November list of predictions for 2011. But the market research firm warned: "While all types of natural claims have grown in importance in all regions, and across all product categories, the term ‘natural' is still ill-defined. Terms that are vague or not well understood will come under fire and we are due to see an intervention of regulatory bodies." "Natural" usually is a given when discussing botanicals. And health-directed beverages often are a major testing ground for more exotic flavor concepts because unique flavors typically are called upon to compensate for calories. One beverage maker adept at striking that balance is Herbal Water Inc., Wynnewood, Pa., makers of Ayala's Herbal Waters, beverages that rely on culinary herbs to achieve full flavor without calories. "Ayala's is highly appreciated by people who care about their health and well-being and seek a zero-calorie beverage that achieves great flavor without additives, colorings and preservatives," notes Ayala Laufer-Cahana, an M.D. and vice president of product development. "It also appeals to foodies — people who appreciate sophisticated flavors." Those "sophisticated flavors" include lavender mint, lemongrass mint vanilla and lemon verbena geranium. Ayala's Herbal Waters followed up its single-serve, still waters with similarly herb-infused sparkling waters in 750-ml "wine" bottles. Ayala also makes sparkling herbal waters in elegant glass "wine" bottles, designed to bridge the gap between water and wine. "It's a drink that can satisfy diners who are looking for a sophisticated flavor companion to food, but are looking for something non-alcoholic and non-caloric or that would fit in with an everyday family dinner or in a white tablecloth restaurant," says Laufer-Cahana. "As a pediatrician, I always advocate against sodas and sugary drinks," she continues. "And I'm an amateur gardener and serious home cook, so I started using the herbs I grew to create beverages for my family and to pair with meals we share when we host. Herbs are naturally flavorful and aromatic, and virtually calorie free. The response to the home-made brews led us to think these herbal waters answer a need in the market." Antoine Dauby, group marketing director, says Naturex Inc., Hackensack, N.J., expects to expand its floral plant extracts collection to include offerings such as rose, hibiscus and Brazilian cress. One challenge with botanicals, however, is their flavor components are volatile and can disappear rapidly when exposed to air, light or heat. Naturex recently launched two new flavor technology subcategories: Aquaready, a range of products dispersible in water and low-fat products; and EZ-Caps, a delivery system that protects aromatic compounds from losses or degradation of the aromas over time. Superfruits are alive and well for the New Year, with both a favorite and a sleeper expanding into new areas. Rising interest in vegan proteins is among the drivers. "Our newest flavor, Amazon OJ, will hit retail stores across the country, including Whole Foods Market," says Jeremy Black, chief brand officer of Sambazon, San Clemente, Calif. Amazon OJ is an organic blend of açaí, orange juice and acerola juice, rich in vitamin C and low in sugar. "Around March, we will be launching two organic protein superfood smoothies that deliver 10g of vegan protein per bottle. Interest is not just in exotic superfruits. Perhaps the "return to basics" mentality of the recession has reopened eyes to familiar superfruits, such as pomegranates, cranberries, various berries and other antioxidant-rich domestic delights. "Cherries and in particular cherry juice are now receiving more attention as a recovery drink for post-exercise pain," says Brian Packer, account executive for the Cherry Marketing Institute, Lansing, Mich. Tart cherries are a good source of melatonin, a natural anti-inflammatory that may decrease swelling in the joints and muscles. Rich in antioxidants like other superfruits, tart cherries have always received less attention than similar fruits, but this may be the year they break out. Earlier this year, the Cherry Marketing Institute surveyed R&D professionals at several companies. One of the major findings was that cherries are broadly appealing but underleveraged. "We are seeing increased interest moving into 2011," says Packer. "One of the newest products to hit store shelves is the Cherry-Pomegranate Nutri-Grain Superfruit Fusion bar," a whole-grain and fruit bar created by Kellogg Co. Turtle Mountain staked its initial claim on nondairy frozen confections with soy milk as a base. Now, for consumers trying to avoid soy, the company adds products based on coconut milk and coconut water. Coconuts, too, have seen a huge increase in popularity, with some dozen coconut water companies springing up in recent years. One of the most innovative applications of coconuts has been the positioning of coconut water as a sports drink due to its natural richness in potassium and low calorie profile. But coconut milk is also surging. Turtle Mountain LLC, Eugene, Ore., has taken the coconut to a new level by making coconut milk the base of its dairy-free frozen desserts. "The inspiration for these innovations is really our customer," says Chris Turek, Turtle Mountain marketing services manager, "They're seeking quality dairy-free products, and specifically are seeking alternatives to soy. Coconut has a great taste with unique health attributes and is incredibly versatile as a base ingredient. Much of the credit goes to John Tucker, V.P. of Marketing and Technology at Turtle Mountain, who saw the demand in the marketplace, conceived the ideas and, with the help of his R&D team, made them a reality." The popularity of nuts as boosters of flavor and health has led to a unique application of nuts via a byproduct: almond "bran" (actually the skins). Much as bran is a beneficial byproduct of refining grains, almond skins are a nutritious byproduct of blanching almonds. Almond skins have now been transformed into a safe, low-fat and nutrient-dense product suitable for use as an ingredient (in place of or in addition to other nut forms) or as a supplement. Almond bran is manufactured by Nut-trition Inc., a division of Hughson, Calif.-based Hughson Nut Co. Since much of the non-fat nutritional aspects of nuts are found in the outer seedcoat, it has many of the health benefits of almonds with less than half of the fat and can thus reduce cost and calories. "When formulating protein beverages I find myself leaning towards popular classic flavors like chocolate and vanilla," says Rick Oliverio, senior application technician at Fona. "These flavor profiles tend to pair best with dairy, especially when working with whey proteins. Depending on the base, I might choose a flavor like chai tea, which gives an overall pleasant and long lasting flavor and finishes nicely." Increased interest in functional ingredients presents new challenges to processors who want to pump up the potency without putting off the palate. Flavors can cover the potential unpleasant taste of added nutraceuticals. "Chocolate and nut flavors mask protein really well and tend to be the top sellers," says Carrie Jaeger, senior scientist at Wild Flavors, Erlanger, Ky. "Flavors we often use in functional nutritional bars include Cookies & Cream, Dulce de Leche, Rocky Road, Caramel and Peanut, as well as superfruit-based flavors and ‘dessert-type' flavors." According to Jaeger, Chocolate Chip Cookie Dough and Oatmeal Cookie flavors are other popular options. "All are typically enrobed in milk or dark chocolate, and we've also enrobed caramel bars in white chocolate." Jaeger further notes superfruit-based flavors and dessert type flavors come into play for these new formulations, especially with cereal/fruit bars. Flavors might include citrus and vanilla blends—which are excellent at masking a variety of functional ingredients. Many of the off-notes associated with nutraceutical ingredients have a delayed onset. Carefully select masking agents that are appropriate for the particular nutraceuticals and work with flavors that are longer-lasting or have a late hitting profile, suggests Fona's John Fishel. "We've found certain vanilla, chocolate and sweet brown flavors work well for this." The Fona team also notes peanut butter flavors are experiencing an uptick in popularity, and they work well to mask nutraceutical ingredients in food products such as nutrition bars because of long flavor duration, especially at the end of the profile where most off-notes are perceived. And caramel flavors deliver strong "brown" sweet notes that pair well with the base of nutrition bars and enhance sweetness. Pairing classic "comfort" flavors with fruits and herbs or spice flavors in health formulations is spreading. "People tend to still want indulgent flavors even though they want healthier products," says Jaeger. Flavor combos have included Dulce de Leche, Chocolate Cinnamon and Cinnamon Pastry and paired flavors such as pineapple pear, lemon-mint and fruit and ginger. "In general, fruit flavors in combination with spicy flavors tend to work well," she adds. Heather Biehl, manager at Wild's H.I.T.S. (health ingredient technologies and solutions) team, agrees. "Citrus flavors, with some vanilla notes, are employed as balancers to nutraceuticals. For example orange carambola, lemon meringue, pineapple lulo and grapefruit pummelo work well to mask off-notes associated with omega-3s, CLA [conjugated linoleic acid] and protein," according to Biehl. "Dark berry flavors such as pomegranate pinot, blackberry grape, blueberry black currant and yumberry go well with the astringent notes of polyphenols from tea, resveratrol and grapeseed extracts. And herbal notes from guarana, echinacea and yerba maté pair well with sweet flavors like strawberry, cherry, grape or floral flavors like lavender or chamomile."